Hi Frugalistas! I’m thrilled to bring you this special British Airways First Class review from David C. Moore, author of Turning Left Around the World. David and his wife Helene started their special trip in a very special way – in the British Airways 787 Dreamliner First Class from London to Santiago. I’ve had the opportunity to try the British Airways Business Class, but never the First Class, so I was so pleased to be able to commission this British Airways 787 Dreamliner review of David and Helene’s experience in the BA First Class. My wife Helene and I had been planning our once-in-a-lifetime adventure for nearly a year – 10 months Business and First Class travel around the world visiting 15 countries to explore the history, landscape, wildlife, people and food of each destination across South America, Australasia, the Polynesian Triangle, Southeast Asia, China and Japan. Our journey was to include the Atacama Desert, Galapagos Islands, Easter Island, Machu Picchu, Ayres Rock and the Great Wall of China, but our start was British Airways newest and longest direct route of 11,645 km taking over 14 hours from London Heathrow to Santiago, Chile. The flight was on the airline’s latest and most high tech plane, the Boeing 787 – 9 Dreamliner. 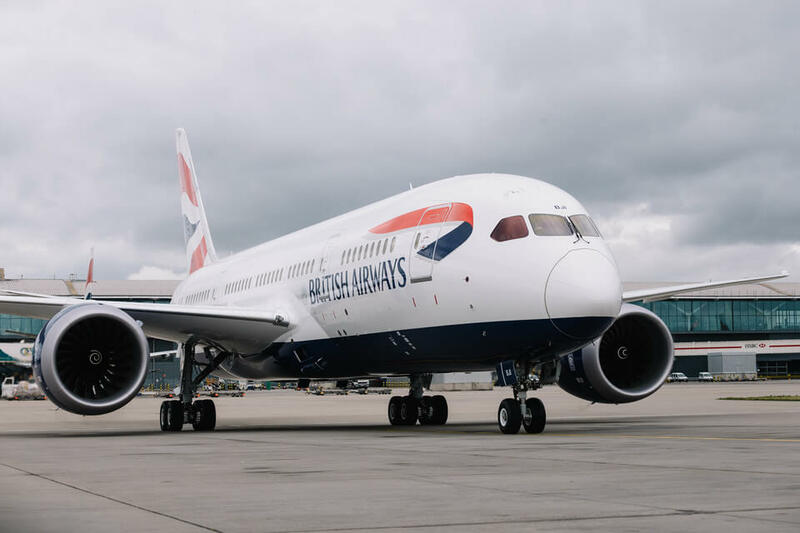 It is 7 metres longer than the 787 – 8 accommodating 216 customers including just eight technologically advanced and very private suites in First Class, the fewest in any of the BA fleet. 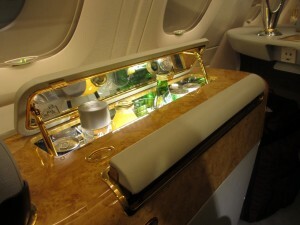 This was too good an opportunity to miss, so we upgraded to First Class at the airport for a very reasonable £500 each. The single ticket would have usually cost over £9,400, bizarrely more than the total cost of the Business Class OneWorldExplorer tickets we were using to travel around the world for 10 months. This gave us the opportunity to visit the newly refurbished Concorde Room (note ‘Room’ not Lounge) at Heathrow’s T5 and enjoy the ‘first class wing experience’ as BA calls it. 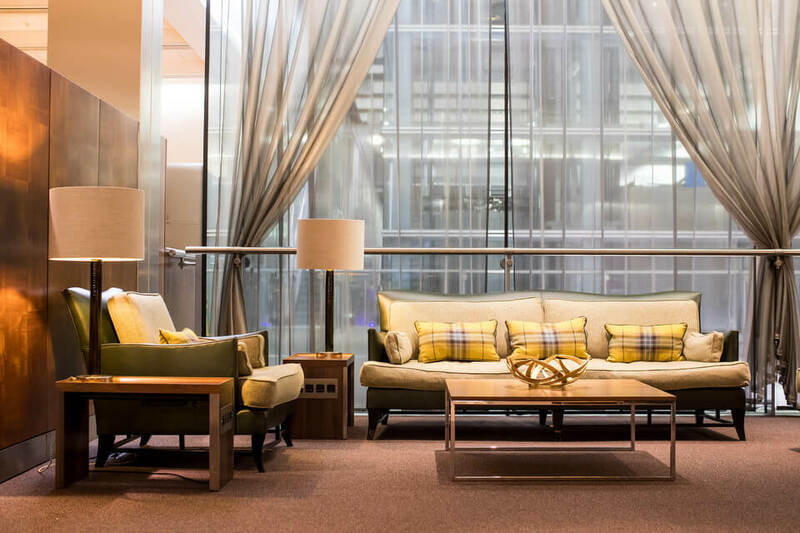 Unlike the other Galleries First Lounge, the Concorde Room is reserved exclusively for British Airways First Class passengers. We were expecting the bar to be raised very high for the other lounges we were to visit during our 53 flights around the world, and were not disappointed. Leaving the frenetic chaos of T5 Departures we were ushered into the calm and serenity of the First Class Wing and escorted quickly and efficiently through security. The lounge, because that is what it is, is vaguely reminiscent of a London gentleman’s club with its high end spirits, vintage wines and free flowing champagne – Laurent Perrier Grand Siecle no less. It was surprisingly quiet when we arrived and the staff were extremely attentive as we explored the best BA can offer, including the Boardroom for a last minute catch up with the office, the Elemis Spa – that had we known we would have booked – and private cabanas with comfortable sofas, television, bathrooms and private shower. If it’s privacy you want then the British Airways First Class Concorde Room certainly delivers. The dining room is divided into private booths for two and there is a more casual eating area for larger groups. We opted for our own booth and shared a delightful Pouilly-Fume while perusing the excellent menu to match any of London’s most premium restaurants. 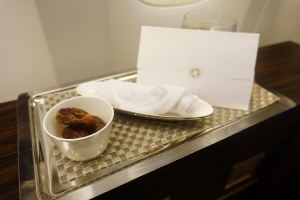 We decided to select a main course only; there is always the onboard service to look forward to. Helene chose the ox cheek bourguignon with potato puree and savoy cabbage, while I ordered the pan fried sea bass with butternut squash and cranberry and chilli salsa, both were beautifully presented and delicious. It is difficult to fault the service, ambience and quality of the Concorde Room, in hindsight only one other came close; the Miracle First Class Lounge at Bangkok Airport, but with a name like that it has to be good. 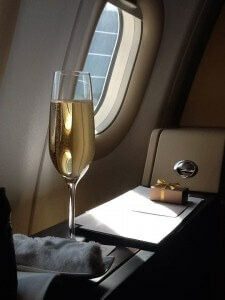 As we boarded the aircraft more champagne was served along with a warm greeting by name from our cabin crew – always a nice touch. 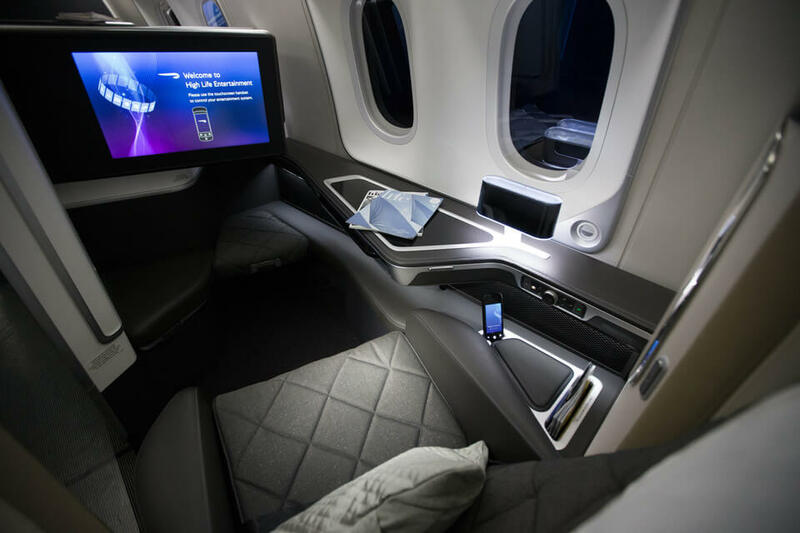 The new BA First Class cabin is as technologically advanced as the fuel efficient use of carbon fibre in the fuselage, they are designed to maintain privacy, clearly an important requirement BA has identified their first class passengers expect. There is a lot more space in the British Airways First Class seats than in a Club World seat with large windows where those awful pull-down blinds have been replaced by the passengers own electrochromic dimming facility. Also included are two useful USB sockets and a power point, a large wide screen 23 inch television and bags of storage space. With all this technology I would have expected onboard wi-fi, but no, we would have to make do with the in-flight entertainment which given the length BA has gone to with the wide screens and headphones I thought may be a little more extensive and up to date in its offering. The excellent menu and selection of wines carries on where the Concorde Room left off and was as good as can be expected from a meal served at 35,000 feet. 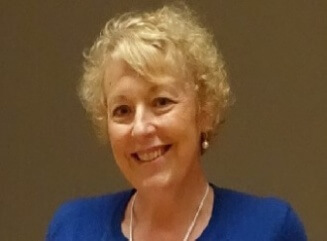 Helene and I were able to eat together in the sizeable suite and as usual on a long haul flight we were both looking forward to our flat-bed sleep. Was it the free flowing champagne, the fine wines and the two excellent meals within only a few hours of each other or the very comfortable pyjamas, the soft mattress and warm duvet that gave us the best night’s sleep on a flight we had ever had? Either way it was excellent. 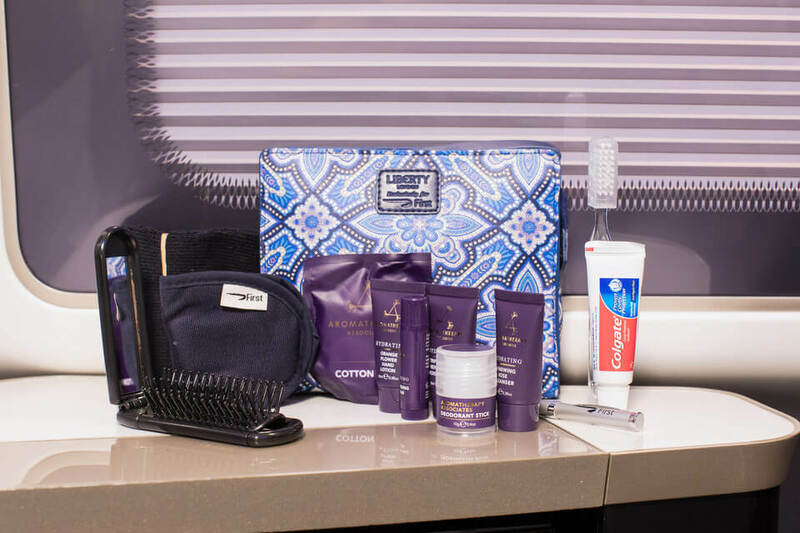 The overall experience of the British Airways 1st Class may not quite have reached the standards of Etihad or Emirates First Class but it’s not that far from it. If its privacy and attentive service you want then the first class Dreamliner service more than delivers, I’m looking forward to the roll out across other long-haul routes. 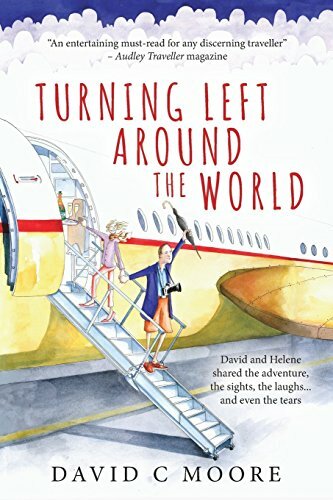 David C Moore is the author of a new book ‘Turning Left Around the World’ based on their 10 month adventure visiting 15 countries. The book is published by Mirador and available now on Amazon. What are the Most Expensive Countries for Uninsured Tourists?